Forbes ranks Durham, North Carolina 5th Geekiest City in America. I always had a suspicion the area surrounding The Escapist offices was a Mecca for nerds, dorks and gamers, but now I know it's for real. The Forbes website recently compiled a list of 20 American cities organized by what percentage of the workforce was employed by "tech" companies dealing with computers, robotics, and gaming. The area of Durham, Raleigh and Chapel Hill is also known as the Research Triangle, and Forbes reports a whopping 15.5 percent of the workforce there - some 41,560 workers - work in "geeky" professions. The list also pointed out Durham "hosts Duke University and the third-highest percentage of adults with at least a bachelor's degree." But it's not just Duke, the Triangle is home to a variety of notable universities such as N.C. State and the University of North Carolina - Chapel Hill, famed in particular for their exceptional men's college basketball team and for being the oldest public university in the nation. The area also boasts a sizable gathering of video game developers and publishers including makers of Gears of War and the Unreal engine, Epic Games, Rachet & Clankers Insomniac Games, the offices of GPU-makers Nvidia, Tom Clancy's favorite game developer Red Storm Entertainment, Virtual Heroes and The Escapist itself. North Carolina is also known for its beautiful landscapes, enabling the state to host a number of famous films including Hannibal, Forrest Gump and Blue Velvet. Most recently, Marvel Studios began Iron Man 3's first day of production at Epic Game studios. The blockbuster is being shot over the next 10 months at other locations in the Triangle, Miami and China. Hopefully we'll figure out why there's a large Christmas tree on Epic's front lawn in June when the film is released. If you're interested in verifying the geekiness of our area, please come visit us this September at The Escapist Expo. 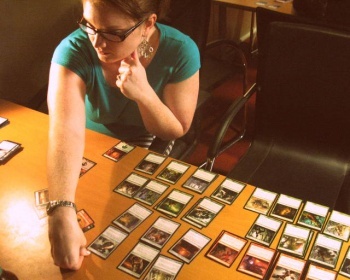 Image: Myan plays Magic to fight cancer at The Escapist headquarters.